The stars who left Erinsborough for Tinseltown. As a longtime resident of Erinsborough, the fictional town in which long-running and much-loved Australian soap Neighbours is set, actor Daniel MacPherson enjoyed many major storylines and moving relationships while playing handsome young athlete Joel Samuels. Since leaving the show Daniel’s success continued thanks to high profile presenting stints on The X Factor Australia and Dancing with the Stars, along with acting work on popular MTV fantasy series The Shannara Chronicles. 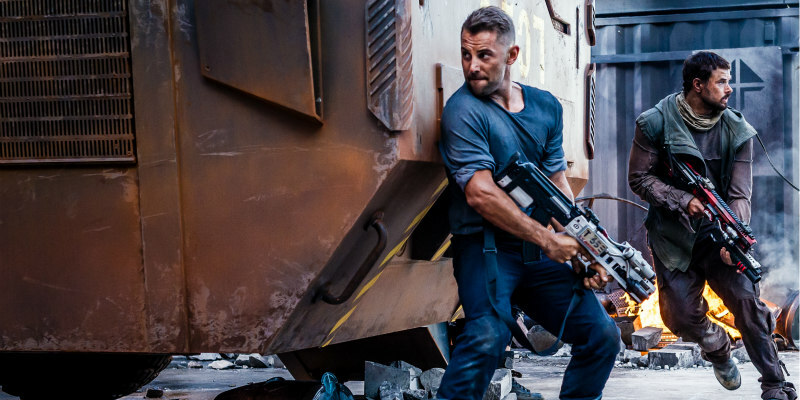 He can next be seen in soon-to-be-released movie, Origin Wars, a thrilling new sci-fi adventure in which he stars alongside Twilight’s Kellan Lutz and Isabel Lucas, of Transformers fame. The new film is set in the future in a time of interplanetary colonisation. Sy (Lutz), escapes a brutal prison where mysterious experiments have been taking place under the watch of a savage warden (Temuera Morrison, Star Wars Episodes 2 & 3, Once Were Warriors). After orchestrating an escape, Sy meets Kane (MacPherson), a lieutenant working for an off-world military contractor - EXOR, who have set in motion a plan to wipe out all life from the face of the planet in an attempt to cover up their crimes - when their terrifying “experiments” escape. Now, the unlikely pair must work together to rescue Kane’s young daughter, Indi (Teagan Croft, To Kill a Mockingbird), and reach safety. Teaming up with a pair of rough-and-ready outlaws, Gyp (Lucas, Transformers: Revenge of the Fallen) and Bill (Luke Ford, The Mummy: Tomb of the Dragon Emperor), it’s a race against time for the group as they clash with EXOR while battling the savage creatures that roam the planet. His time in Erinsborough may have been brief, but Russell Crowe demands a mention on account of being one of the biggest actors on the planet. Before picking up his Best Actor Oscar for Gladiator and showing his range across box-office hits including A Beautiful Mind, LA Confidential and Les Miserables, Crowe paid his dues on Neighbours appearing on four episodes back in 1987. As Kenny Larkin, Crowe played a darts hustler at local bar, The Waterhole, tricking young Henry Ramsay out of his cash. Another acting heavyweight, Guy Pearce rivals Russell Crowe in the acting stakes and the paired even squared off against each other in hard-boiled cop classic LA Confidential. Pearce has won acclaim for roles in Memento, The Hurt Locker and Priscilla Queen of the Desert over the course of his career, but it all started with a lengthy stint on Neighbours as Mike Young, best friend of legendary couple Scott and Charlene aka Jason Donovan and Kylie Minogue. After a breakout role in Martin Scorsese’s The Wolf of Wall Street, Margot Robbie earned geek superstardom after putting her own stamp on the part of sweetly psychotic super villainess Harley Quinn in Suicide Squad. The actress might even have drawn on her days on Ramsay Street to get into character; as soap-siren Donna Freedman she got up to various kinds of mischief, including stalking and arson! Margot will be back in the guise of Harley Quinn for super criminal team-up movie Gotham City Sirens. Respected actor Ben Mendehlson has enjoyed notable roles on high-profile hits like The Dark Knight Rises and The Place Beyond the Pines, but he truly gained international stardom after appearing as chief antagonist Krennic in Star Wars: Rogue One. Now the actor, whose Neighbours stint consisted of a 1987 run as Warren Murphy, has his pick of roles and can next be seen as the Sheriff of Nottingham in an upcoming Robin Hood movie and in Steven Spielberg’s epic new game adventure Ready Player One. Up-and-coming actress Bella Heathcote’s big-screen break came with a role on Tim Burton’s kooky comedy-horror Dark Shadows alongside Johnny Depp, Michelle Pfeiffer and friends. Following up with roles in steamy thriller Fifty Shades Darker and on hit TV adaptation The Man in the High Castle, Bella’s career has come a long way since her days as the school bully at Erinsborough High. As mean-girl student Amanda Fowler, the Australian actress delighted in tormenting her good-girl nemesis Kate Ramsay. All the Hemsworth boys have made an appearance in Erinsborough with middle brother, Thor himself, Chris getting the ball rolling after appearing in just one episode in 2002. Next up was youngest brother Liam, now famous for his part in the Hunger Games franchise, faring slightly better with a brief stint in 2008. Finally we have the oldest Hemsworth brother Luke, who enjoyed two runs on the show as two different characters, first in 2001 and then again in 2008. Along with a role in Origin Wars, Luke can currently be seen in the big-budget television remake of sci-fi classic Westworld. Holly Valance introduced herself to Hollywood in video game adaptation DOA: Dead or Alive, which featured a steamy scene in which she takes out a room full of bad guys while wearing only a bath towel. Enjoying some success as a popstar in the UK, she also went on to appear in the likes of Taken and Prison Break. As Felicity ‘Flick’ Scully, Holly was often involved in relationship drama, including a lengthy spell with Daniel MacPherson’s character Joel.